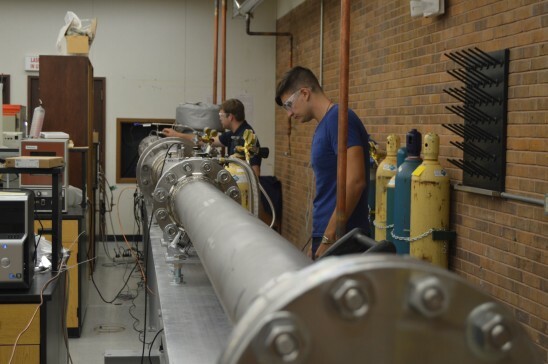 Graduate student Owen Pryor shows undergraduate student Justin Urso how to operate the shock tube in Subith Vasu's lab. Supercritical carbon dioxide is an attractive alternative to government agencies and private companies for several reasons. If the technology can be developed to make the switch, it could mean less use of water – a natural resource in short supply in some parts of the nation. Commercial companies are also interested because supercritical CO2 is more efficient at transporting heat – a key principle, which power plants use to generate energy. Better efficiency equals less cost and potentially a bigger profit margin. In addition, it is possible to reduce the size of power-generating turbines by using sCO2 instead of steam. Using sCO2 as a working fluid enables carbon capture and storage) in certain cycle systems. In those systems, the power plant exhaust CO2 is stored underground instead of released into the atmosphere. Justin Urso is a graduate student, MSAE track. Source: I am he.